Posted on Mar 8, 2018 in Conflict Resolution,HR,Workplace Behaviours . 0 Comments. Tony, it’s Jane here. Sam and Sandy are at it again. I keep saying to them “Look, let’s not get emotional. Let’s just deal with the problem”. I know this can be solved if we just change the process. It’s just that neither of them are willing to do this!!! What’s going on??? What do you think it is? We’ll come back to these questions. 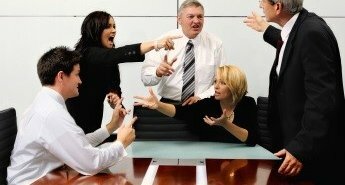 Conflict can be caused by so many different issues in the workplace, structure and process conflict are HUGE drivers. Structures often have people in the same team working at odds due to such things as competing priorities, poor information sharing/flow, skill gaps and different accountabilities (to name just a few). Then there are all the process and systems issues that cause so much heartache! Once process conflict has been occurring for some time it is almost inevitable that interpersonal conflict will develop. Why? Because your people are not working towards the same goal and they will perceive that others are acting in a manner detrimental to their best interest. If they care at all (and we should really hope that they do!!!) this will cause them anger and frustration. Sometimes that will be towards the organisation and other times it will be towards the individual. In any case, they will come to resent the person who they perceive to be working at odds to them. Can a process change resolve the conflict? No. Your people are now having an ‘emotional’ reaction to each other. Their breath shortens, their gut tightens and their anxiety level rises. As is well established, when we are having a heightened stressful and emotional reaction our brains are not in a problem-solving space as it interferes with our ability to problem solve, think flexibly and make decisions. When your people are communicating – that is – when they speak, email, text or IM they are having a response not driven by logic but one driven by emotion. This cannot be process engineered away. It requires them to confront and deal with their emotional reactions. Only then can they work to solve the process issues. This was the conversation that I had with Jane (who posed the original problem here). Sam and Sandy were not working on the process issue together because their ‘emotional temperature’ has not been taken. Even though logically all three of Jane, Sam and Sandy knew that the whole conflict was process driven, they were not in a position to actually deal with it! So once Jane (the manager) and I had worked through this, she properly understood the parameters of the conflict. I was DELIGHTED that Jane was ready to tackle this head on. She was comfortable to have the emotive conversation, she was nervous but not scared. This is a rarity as most of the people we support take are always trying to keep the emotion out of it! Then being able to demonstrate you have ‘heard’ the how and why from the other person. This is where we LOVE the work of Brenne Brown, see here and here (we’ve mentioned it before but really it is soooo good). Jane is skilled and did this well. Other times our clients need our support in that conversation and then the process matter experts come in later. Either way, if you think your people need to confront the emotion, give us a call or drop Zandy or me an email, as being comfortable in uncomfortable situations is what we do best! !